Il Dvorak Resort si trasferisce in blocco in spiaggia. Messaggio per Honolulu: se sentite delle urla siamo noi che dall'altra parte del mare facciamo festini, si prega di non chiamare la polizia. Ringraziamo "la batta da 100" per la solidarietà espressa ai nostri. Finalmente dopo anni di sudore, il presidente Tex ha raggiunto l'ambitissimo obiettivo della Laurea, grandi complimenti a lui e che la festa di tutta la contea di Monterey abbia inizio. 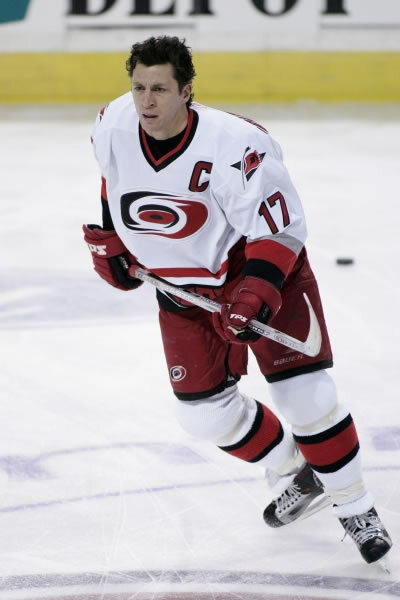 Today during a press conference the Shining Clubbers organization announced that the jersey #17, worn by former captain Rod Brind'amour will be retired prior of the first Monterey's regular season home match, at Computer Discount Arena ( ). Rod the Bod, captain of the 2008/09 Western Conference Champion team that lost to New York in the Stanleit Finals, got traded to Ontario only few weeks later, answering to his will to play near home. "He deserves to be honoured this way" - both Monterey's GMs told the media during the conference - "Rod was the heart and soul of our team and he's always been totally honest with us, asking for a trade when he felt his career was coming to an end, well knowing that his desire to play not so far from home was forcedly bounded to a sad end in a team with low expectations. We also decided to send to him a huge puck-shape tortilla (diameter 10 feet and 5 ft. height) but we did experience some logistic problems, so we preferred to choose a chocolate cake instead (same dimensions), hoping that the Canadian weather could offer a better temperature preservation. This and more to our all-time greatest faceoff winner"
Ultima modifica di ^Tex^ il 01/09/2010, 17:05, modificato 1 volta in totale.